The CW's latest entry into its ever expanding DC superhero franchise is decidedly different from anything else that Greg Berlanti et al has done. And, no, it is not only about the pre-dominantly African-American cast, but also the whole tone and mood of the series. It definitely is not as light and breezy as The Flash or Supergirl, nor is it as irreverent as DC's Legends of Tomorrow; but yet not also not as dark and grim as Arrow. Black Lightning as a point. It is topical. It is gritty. It is violent (or as violent as can be on network TV). It does not shy away from making a socio-political statement reflective of the world we live in now. And for all that, it is an exciting series. The closest - and perhaps inevitable - comparison would be with Netflix's Luke Cage. Thematically they are both similar, but whereas Luke Cage benefited from cable network's PG-standards and a higher budget. Black Lightning impressively did as much with less. 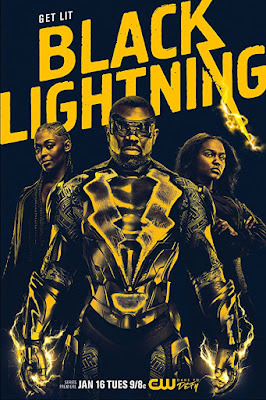 That predominantly boiled down to the excellent cast, with Cress Williams anchoring as Jefferson Pierce and Nafessa Williams and China Anne McClain as his daughters. Black Lightning is about family and the family here is tight. Perhaps the only outcasts would be Christine Adams as Williams ex-wife (she better have a bigger role/purpose other than being the catalyst/distraction) and James Remar as the token techie (unbelievable to say the least). Marvin "Krondon" Jones III seemed to be our primary antagonist, and as scary as it seemed, he ain't no Mahershala Ali or Alfre Woodard. So yes, this is one superhero entry that seemed really exciting to watch.